Within the first few seconds, Vs. Super Mario Bros. tricks you into thinking it’s simply an arcade port of the NES classic. 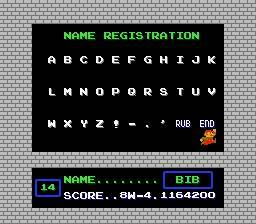 By the end of World 1-1, it’s apparent that the stages have been altered. It starts when you can’t find the invisible block containing the stage’s 1UP after the first set of green warp pipes. You’ll no doubt second guess your memory throughout the game as the stages begin to grow more original. 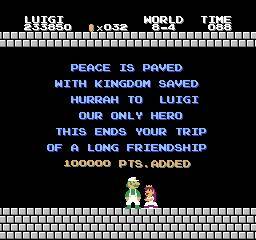 You have now entered The Twilight Zone Vs. Super Mario Bros. Finally, there’s a purpose for that score. Having played loads of Super Mario Bros. recently, I have its stage design burned into my memory. One subtle element of the original’s stage design is the way the developers mislead players in regards to the Warp Zones. Think about it. The first one, in World 1-2, is accessed by running across the top of the stage and avoiding the blatant exit. The remaining two are present in World 4-2. Thinking you’re onto a formula, you run to the end of World 4-2 and sure enough, access another Warp Zone by running across the top of the stage and avoiding another blatant exit. That’s not the one you want though. Whereas the first Warp Zone transported you to Worlds 2, 3, or 4, this one merely progresses you a single world, to World 5. While this fooled me for me many sessions, I finally found the true second Warp Zone. Appearing much earlier in World 4-2, it allows travel to the remaining Worlds: 6, 7, or 8. That’s intentional. Luigi is the Biz Markie of the Mario universe. I believe that sort of thinking was extracted to the entirety of Vs. Super Mario Bros. For anyone coming to it as I have, with the original, forefront in my mind, it’ll throw you for a loop. It appears to look and play the same from the first quarter, but that assumption is bucked within seconds. Because of the differences, it can be construed as tougher, at least for those who have played the original. Additionally, many of the changes are inclusions of stages from Super Mario Bros.: The Lost Levels – the original, much tougher, Super Mario Bros. 2. Plus, playing with a joystick just doesn’t feel right. 1986arcademarionintendosuper mario bros.super mario bros. 2super mario bros.: the lost levelsvideo gamesvs. super mario bros.